I created a custom asset and I can import it using my own UFactory. Importing the file works fine, it creates the asset and everything is working just fine. However, I can't figure out how to enable the reimport functionality. The Handler gets registered in the Editor.cpp file (in RegisterHandler()), so that part works. None of the interface functions are being called though. No breakpoint was hit. 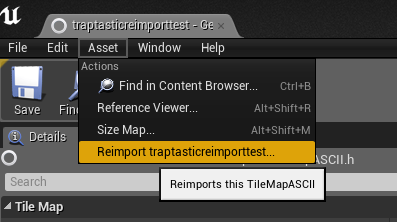 I added UAssetImportData* AssetImportData; to my asset and I set the file path accordingly. 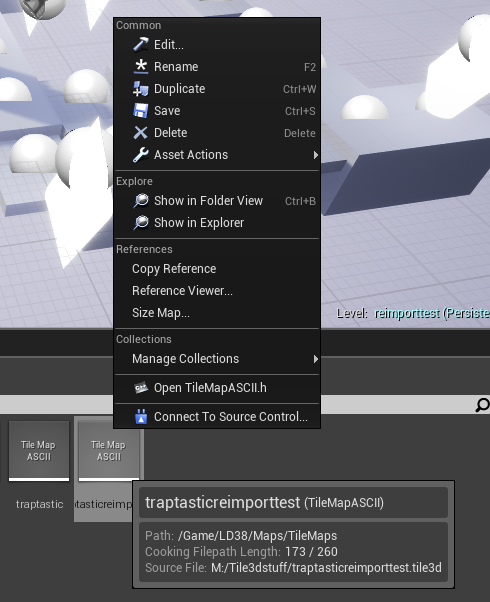 The correct file path shows up when I hover over the asset in the editor. When I right-click the asset, the reimport menu settings don't show up. I went through a few factories and their asset types and copied over pretty much everything that looked like it had anything to do with the reimport, but I still don't get the thing to run. I am trying to track down why my Reimport functions aren't being called, but no success so far. I just found that the import thing shows up in the actual asset editor and reimporting works fine. when I right-click the asset, the import doesn't show up, though. Okay, I tracked the issue down. I had to implement my own FAssetTypeActions_Base and register it with the module. Thanks Denny. Just what I was looking for.